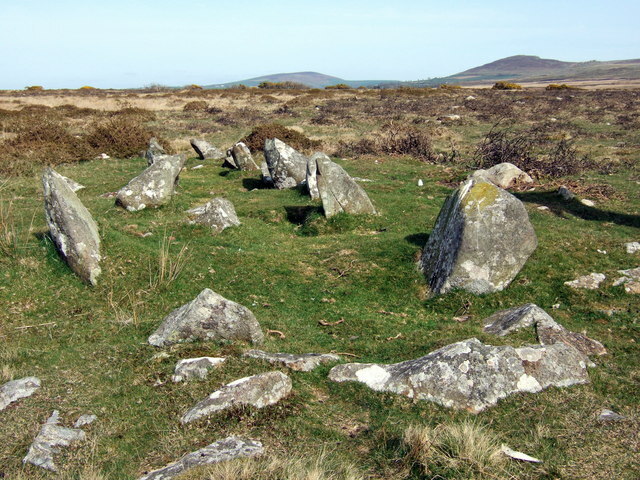 Beddyrafanc Burial Chamber. 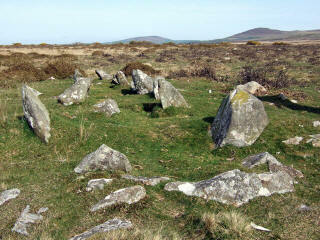 Bedd yr Afanc is a burial chamber dating from around 3500 BC. It was built as a low, oval mound or cairn within which was a "gallery grave". The main part of the grave is the passage, with ten pairs of upright stones about half a metre tall. 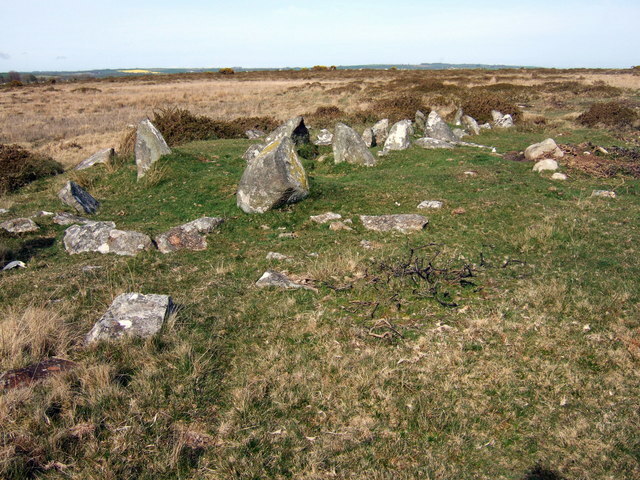 This leads to a small, circular chamber at the west end of the mound, marked by seven stones of similar size. None of the capstones have survived. Located at the centre of a U shaped valley, on a slightly raised oval plateau surrounded by a raised bog. It is believed to be the only example of a gallery grave in Wales. The name can be translated as "monster's grave" - the "afanc" in Welsh folklore was a creature something like a giant beaver. On open moorland south-east of Brynberian, a hamlet on the B4329 Haverfordwest-Cardigan road. Off the A487 between Cardigan and Newport take the B4329 to Brynberian. On open moorland SE of Brynberian. When you leave the road head roughly south east, initially the path is someones driveway which then goes off right opposite a gate made of corrugated iron. Follow the path/track until you get to a rusty old gate on the other side is common land. Follow the fence on your right eventually coming to marshland, keep following the fence, when fence veers off to north you are on edge of bog and you may be able to see it in front of you. There is a slight path heading into the open marshland, relatively dry, follow it look ahead and slightly right and hopefully you'll arrive. In the nearest village of Brynberian. Good walking boots, bottled water, weather protective clothing, and emergency gear just in case. ND grads, polorizer, telephoto lens and wide angle. Special Needs Access: Difficult ground is boggy and its a steep climb in places. Children Facilities: None specific, watch the main road for traffic, once on path they will enjoy the open access.